We offer agents a COMPLETE BUSINESS SOLUTION that includes an all-encompassing website with a range of quote engines including term life and Medicare Supplement insurance. This website will always be free to insurance agents. The free NAAIP website includes our Smart Client Data Capture system which helps you, the agent, capitalize on every visitor to your site. By simply requesting a quote, their submission converts as a hot lead which is then emailed to you and stored in your NAAIP agent back-office. This alone will increase your online business potential and earn you money! Check out your free NAAIP website and back-office by taking the tour! Agents with the most productivity are rewarded with the highest level commissions, and real-time exclusive leads are given to those that contract with NAAIP. 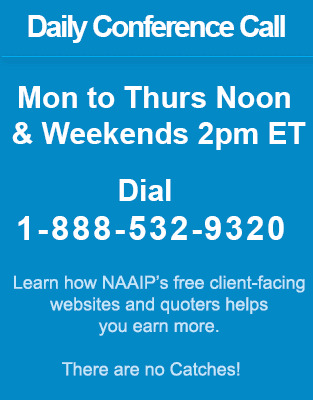 In addition, agents who already have or buy a new domain name will have their free web site hosted by NAAIP. This means that you will have a 100% independent business website with all the support and features that NAAIP offers, and all you have to do is buy a domain for as little as $5 per year. NAAIP will look after the rest. You are invited to join our daily conference call for a more detailed explanation of our impressive technology, insurance product portfolio and free lead program.